What is a Car Jack For? How Does a Jack Work? Where Do You Place a Jack Under a Car? How Do You Jack Up a Truck? How Jack Stands are Rated? How Much Does a 3 Ton Jack Lift? How Much Weight is a Car? 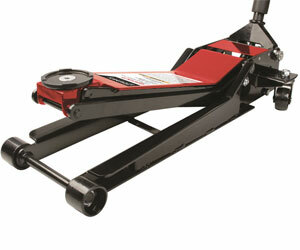 Having a floor jack is a real convenience if you work in a garage or fix your vehicle yourself. But choosing the best one could be a tough job and require a lot of time and energy. What you exactly need is a sturdy, high-quality jack that offers excellent performance and lift each time. It takes time to understand a tool properly and here I have researched for several months to create a list of the top jacks available on the market. To provide you the most valuable information, I cleaned all the mud jacks to reach to the top 10 floor jacks and summed up their pros and cons. I have compared the car jacks in the below chart. This will give you quick idea about the product and its major specifications. If you own vehicles, then Arcan ALJ3T Aluminum can make your life easier in many ways. The best thing is that you don’t have to rush to the near-by mechanic for minor fixing tasks, thus saving your extra expenses. Although ALJ3T is a low-profile jack which offers you the power of a pro. This powerhouse can effortlessly lift around 3 tons from 3 ¾ inches to a maximum 18 ¼ inches. So, it is an ideal choice for trucks, vans, cars and even SUVs. At this point, if you are concerned about the durability and sturdiness of this model, it could be the most appropriate deal for you. ALJ3T ensures exceptional construction, increased strength and remarkable durability, all thanks to its reinforced lift arm and thick side plates. Bypass and overload valves are also there to prevent over-extension of jack usage and hydraulic ram. It weighs only 56 pounds while it can lift up to 3 ton load. Maneuverability is significant while positioning a jack under the vehicle. Therefore, this particular model comes equipped with wide-track front wheels and ball bearing rear caster wheels to offer smooth rolling, superior stability and excellent maneuverability. It also allows you to place the unit effortlessly right where you want it to be. All in all, this sturdy and efficient jack delivers what it promises. It is a must-buy, must-have equipment to add in the toolbox. It does a great job with the help of its dual pump pistons and hydraulic system. Side plates of the main frame are thick that make it more reliable in all thick and thin. 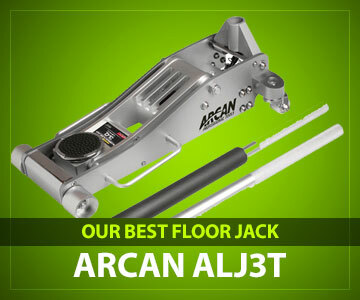 So if you are looking forward for the jack that helps you out without making any mess, Arcan ALJ3T Aluminum is made for you. The next best jack in the list is Sunex 6602LP, which is designed according to the requirements of the targeted audience. Therefore, this model is quite easy to use. In fact, anyone can operate it efficiently without seeking any professional help or using extra tools. In case you need any guidance; a user manual is also included in the package to assist you thoroughly. Talking about its appearance, this jack is not compact in structure and some users may find it bulky to carry around as well. However, these drawbacks can be overshadowed by a bunch of remarkable features offered by this tool. No matter, you wish to lift a van, car or a heavy-duty truck; Sunex 6602LP is simply a must to consider for any vehicle. This equipment promises an excellent quality to ensure customers’ satisfaction. Moreover, it has a sturdy and durable aluminum body that eventually makes this jack a long-lasting and worthy investment. Not just this, Sunex 6602LP is backed with 1-year warranty too. Isn’t it a great deal? Sunex itself is a well-reputed brand in the automotive repair industry, and this model is considered as one of the finest products launched by this brand. Ever thought that you could get so many qualities in a single jack? So, what are you waiting for? Give it a shot! The title says it all! This jack has a maximum weight limit of 3 tons and most of the users might not even have cars that weigh around 2.5 tons. The lift range is between 4 to 18.25 inches. Because of its aluminum frame manufacture, it weighs only 59 pounds. You might think that it’d break due to its aluminum frame, but that’s not going to happen as it also comes equipped with a heavy-duty steel lift arm, which adds to the overall strength of the jack and makes it a long-lasting tool. Its quick lifting, dual-cylinder hydraulic system comes equipped with a safety valve to avoid overloading. This system helps in lifting loads quickly and saves a lot of time. To provide the maximum output, it is essential that the lifting capacity of a jack should be greater than the weight of a vehicle. Powerzone 380044 offers a great weight to capacity ratio. With its fixed front wheel and caster-type rear swiveling wheels, you can expect easy positioning and rolling. Additionally, there is a rubber saddle which keeps the body of the car completely safe. All in all, it is an easy to use tool that comes with a two-piece handle. This handle has a foamed lower part which makes sure that your vehicle remains safe and sound while pumping. You may think that it is overpriced but in front of its features, you are saving many bucks. 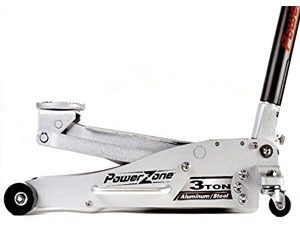 Powerzone 380044 3 Ton is built for performance and portability. It is made in China but the built quality never let you down. Over all, it is a great buy for those who don’t want to change their tool every other day. The most prominent feature of any optimum quality jack is its lightweight. Fortunately, JEGS 80006 is not just low-profile, but reasonable in price as well. So, why breaking the bank when you can get your hands on a superbly-designed jack at a reasonable price? This tool is made specifically for those who can’t afford visiting a mechanic every other day. It helps the user to lift any vehicle to the height of maximum 19 ¼ inches and minimum 3 ½ inches. No matter, you own a truck, car or a van; JEGS 80006 promises not to disappoint you in any way. Besides having a lifting capacity of 4,000 pounds, this model entails a bunch of other excellent features that are bound to gather a lot of appreciations from its users. Its saddle can rotate to 360 degrees, which eventually results in an easy and smooth lifting. Apart from this, a two-piece handle is also there along with handle sleeve to protect the sides of a vehicle, throughout the operation. With the length of 26.5 inches and width of 13 inches, JEGS 80006 is compact and space-efficient in design. Its front wheels are made of Aluminum while rear wheels are caster-style and can be swiveled for better positioning. Moreover, it also has 2 side handles that help in easy lifting. All in all, this jack is suitable for low-profile vehicles and requires little maintenance. If you give a little time to this tool, it will prove itself to be a great companion. The next highly recommended jack in the list is Arcan XL20 Black Low Profile. As the name indicates, it has a low-profile that is a plus point. The first thing that is going to attract its buyers is its compact, appealing and space-saving design. Secondly, it has many features to offer at a reasonable price. Besides being lightweight, this tool is quite heavy regarding features. It comes equipped with the dual pump pistons that enable the user to lift their vehicle speedily. Moreover, it works on Universal joint release mechanism that aids in precise control, improved stability and overall smooth operation. The body of Arcan XL20 is made of heavy-duty steel to ensure an increased durability, thus making it a long-lasting investment. To prevent overloading, this phenomenal jack entails a safety valve. It also includes a 45.3 inches long 2-piece handle along with a bumper pad to offer further convenience to the users. Over all, Arcan XL20 is worth your investment because it is space-saving and attractive in design, efficient in performance, sturdy in construction, reasonable in price and above all, it is launched by a well-known brand that is famous for producing high-quality products. All in all, it’s a great jack at reasonable price. Aren’t you excited about this jack already? Powerbuilt 620422E is one of the highly appreciated jacks out there. Although it is slightly bigger as compare to other models in the list, the performance, efficiency, and quality of this equipment are certainly remarkable. Powerbuilt 620422E entails an extra-wide footprint that promises an excellent stability and balance. This footprint is 15 inches in width from the front and 12 inches from the back. Once it lifts any load, it can be secured with the help of its locking bar. This equipment can replace an ATV jack, floor jack, bottle jack and jack stand, all thanks to its versatile design. To make lifting of bikes, tractors and ATVs more comfortable and convenient, Powerbuilt 620422E comes equipped with a removable jack saddle. Besides, built-in anchor loops are also there to move, store and safely secure your motorbike on the Triple Lift. All in all, this jack is worth your investment in every way and surely is one of the top picks! The Powerbulit jack can lift almost anything with wheels effortlessly, including cars, vans and even heavy-duty trucks. The best thing is that this tool can save your extra expenses in so many ways. It is not just reasonably priced, but this model requires less maintenance as well. It reduces the hassle of visiting a mechanic every other day. With a little maintenance, you can use this tool for long. In short, purchasing this jack will not leave you in regrets. Are you the one who loves stance rides and you have your car lowered? Pittsburgh has a low profile which makes it easier to put it on lowered vehicles as well. Everything is safe with the extra wide steel casters. All loads can be lifted in only 3-4 pumps because of its Dust Piston Rapid Pump technology. 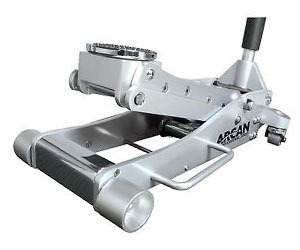 This floor jack possesses an industrial grade finish which is why it is recommended to all the mechanics as well. With a parallel system, you can have the car lifted in fewer pumps. Comparing this floor jack with others, I strongly feel that this one can be used for all types of vehicles. It comes with a two-piece knurled steel handle for a sure grip, so you don’t slip it off easily. It also has a piece of foam is attached to its bumper avoid any damage to the vehicle. With universal joint release setting, you can control load precisely with the help of its handles. Pittsburgh products never disappoint its consumers and Automotive 3 Ton is second to none. Handling an ultra-low profile vehicle in unfortunate situations is a tough task but this jack comes to help you with its well-thought design and quick lift. Although, it is also a Chinese product, but it has a strong built and finish. With a decent price-tag, this is something that shouldn’t be missed out. If you are searching for an efficient and sturdy jack to add in your toolbox, then look no further and get your hands on Blackhawk B6350. This tool has a unique design, and its features are equally unique. It is well-suited for lifting any vehicle, be it a sports car or a heavy-duty truck. Blackhawk B6350 has a decent weight lifting capacity that is as high as 7,000 pounds and in other words 3 ½ tons, which allows the user to lift any heavy vehicle effortlessly. Moreover, it works on fast list technology to ensure a quick lift to the jacking point without any load. This remarkable equipment features a swivel saddle that facilitates the user to position the jack without facing any inconvenience. Secondly, this feature also promises user’s safety. A vent plug and built-in internal safety valve also aid in a safe operation. So, it’s a win-win product. Blackhawk B6350 is made of heavy-duty steel, which makes this jack durable and long-lasting. This powerhouse entails a bypass device that prevents any damage caused by overpumping. To offer an extra leverage and to make it easy to store, a two-piece pump handle is incorporated into this tool. Overall, it’s a great buy for anyone who wishes to perform minor car fixing tasks on their own like a pro. Are you one of them? If so, then grab it as soon as today! Torin Big Red is a hydraulic jack, which means it depends on hydraulic pressure for raising and lowering rather turning a lead screw. Although, this model is not much space-saving, it offers a mechanical advantage to the users to perform in a much easier way than the scissor lift. Moreover, to prevent any inconvenience, it is suggested to check for leaks regularly. This equipment can lift a vehicle up to 21 inches and minimum 6 inches. It has an extra-long neck, which makes the process more smooth and speedy. The collar of this jack is removable, and its top is designed with unique grooves that enable the user to create a desirable contact with jacking points on a vehicle. Weighing 44 pounds, Torin comes equipped with metal casting that makes it a substantial product to move around or to fit in the toolbox. However, being bulky is a prominent feature of those jacks that can lift weights as massive as 3000 pounds, which is about 70 times more than its own weight! This model has a sturdy and robust structure that can last you for a longer period, if handled with care. Torin T83006 is finished with a well-applied and even red coating that helps it to withstand any weather, and also protects the unit from rusting. If you are a professional mechanic, you’ll understand that a massive jack will offer more strength and reliability and will be more efficient. Torin has everything that you would need in any ‘jacking’ situation. If you’re a lifted truck happy owner, this floor jack is for you. The next jack on the list in yet another best-seller equipment that is highly appreciated widely for its top-notch features and remarkable performance. Liftmaster 3 Ton is well-suited for lifting any vehicle up to 14.5 inches maximum and 3.15 inches minimum from the ground. Its dual pump quick lift feature makes sure you lift your vehicle in 2-3 pumps only. Maneuvering is a crucial feature of any jack. This particular model offers a smooth maneuvering and positioning, thus allowing a smooth and favorable performance. This jack comes equipped with a built-in weight lifting capacity of around 2.5 tons. Which means it is capable of lifting a wide range of vehicles, including cars, vans, trucks and SUVs. This unit is reasonably priced, which is affordable for a majority. Beside this, it requires low maintenance and reduces your regular trip to the nearby mechanic shop. The construction of Liftmaster jack is sturdy and durable, making it a long-lasting product. Moreover, this tool is safe to use as a unique bypass device is included within the package that prevents the risk of over-pumping. Its safety valve feature also helps to reduce the extra load. It offers an increased durability, sturdy construction, reduced weight, excellent stability and that too without getting hard on your pocket. It is CE and ANSI certified which is given to the jacks that offer great capacity to load ratio. Liftmaster 3 ton is rather underestimated. In actual, it offers great value for a little money. Are you having trouble with your car’s tire or its undercarriage and cannot take it to a mechanic? Don’t worry about it anymore. You can use a car jack at home and resolve the issue yourself. A floor jack is a device which is hydraulically operated and allows you to lift heavy loads such as cars and trucks. It is one of the essential tools used at the automobile repair shops. For a floor jack, lifting an object is very easy, irrespective of its weight. This is because it uses the hydraulic system. Just park your car where a jack is placed, wedge the tires that you do not want to lift with wooden blocks, and make sure you position the floor jack correctly, i.e., it should touch the undercarriage of the car. Then, until the vehicle is raised, keep pumping the handle of the jack. Also, you should know the lift point of your model. Most of the times, people do not place their floor jacks correctly. This results in not only the damage of the car but also the death of many people. You have to make sure that the jack stays in contact with the undercarriage of the vehicle when it is raised high. To find out the proper placement, you should check the manual or call the service department at your dealership. Are jack stands safe or not? Sadly speaking, in the modern times when frauds are most common, there are chances that you get a faulty jack which may not be completely safe for lifting your car. However, if you have researched well, you will be able to find a car jack safety-wise without any problems. Well, a jack that has the arm made out of solid steel and is likely to be much safer than other materials. I have tried multiple jacks over couple of months and found out that top car jacks come with steel and aluminum parts combined to form solid strength as well as an overall lightweight. Therefore, carrying your jack becomes more natural and you never compromise on the safety as well. The answer is that some of the jacks are typically designed for high lifted vehicles such as trucks whereas the others can be used for trucks but they are not built for them dedicatedly. But how? All you need to do is to get two bricks side by side and put your floor jack on it. This will assist you in lifting your truck up easily. Just like other products, floor jacks are also rated. A low weight of the jack combined with a maximum weight limit is considered to be a great jack. Many companies use hand grips to make the jacks even safer for the users. Using a foam bumper on the top of the jack can lead to minimal or no damage to the car. The weight limit of a light duty car ranges between 990 kilograms to almost 2000 kilograms. The average weight of a car is almost 1500kg (1.65 ton). On the other hand, a truck may weigh as much up to 2500 kg (2.7 ton) as well with the average weight at 2000kg. Most jacks have high weight limits such as 3000 kg (3.3 ton) which means that the jack can easily lift a car and a truck as well. Top jack providers always consider all aspects before manufacturing this critical product. As above mentioned products are carefully selected, I assure quality, consistency and durability at an affordable price. There is a chance that many different types of automated floor jacks come in the future which would be able to lift the car using a battery-operated motor. As of now, I personally would go for Arcan ALJ3T or Powerzone. Based on my experience I consider them to be worth paying attention to. Experts think that such technology will be readily available in the next five years. It might be available right now as well but it isn’t very common which is why it is expensive. There are times when a customer gets too confused to find the right product such as a car jack. Reviews can help you in making the right decision. To get the best product, consider all points as mentioned above. For any other questions, you can contact me or manufacturers right away, and I will be delighted to respond you at my earliest. Also, make sure that you read some customer reviews regarding a specific floor jack which you are interested in. This will help you in knowing how users had an experience in their real life. For sure, this buying guide and other tips will help you in getting the best car jack.